One of the more popular programs at UCLA Medical Center, Santa Monica, is the Companion Care Program, which was launched a year ago. According to Valerie Yeo, RN, director of the hospital’s inpatient Geriatrics Unit, many elderly patients feel isolated. Some don’t have family in the area, while others’ family members are unable to spend much time at the hospital because of work or other commitments. The program now provides 45 companions, with a goal of having 200 volunteers who can donate at least one four-hour shift each week. Yeo said poor nutrition and feelings of loneliness, depression and isolation are prevalent in the geriatric population, and the program seeks to counter these and reduce patient stress by providing one-on-one companionship, assistance and access to activities. Geriatric Companion Program at Santa Monica UCLA Hospital. 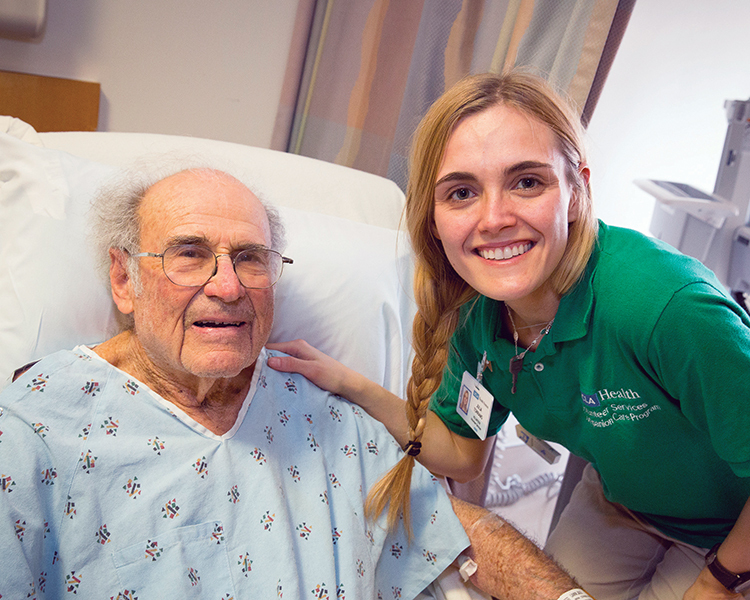 Volunteer companions read to patients, play games with them, assist with feeding and perform other tasks, such as accompanying patients on walks under a nurse’s supervision. Typical is volunteer Julia Torrano, 24, who comes to the hospital every Friday for the Companion Care Program.“I love talking to these older patients who share their wisdom and life experiences,” said Torrano, a Santa Monica resident who’s planning to attend medical school.“This is the most rewarding volunteer program in which I’ve ever participated. Most of the patients just crave talking to people. They love talking about their lives, and I love hearing about them. Volunteers must acquire CPR certification, receive specialized training in the needs and care of the geriatric population and attend a two-hour orientation program. Even with their training and skills, volunteers are not assigned to high-risk patients. The Companion Care Program is currently available only at UCLA’s Santa Monica Campus. To volunteer call Jimenez at (310)351-2527 or emailpdjimenez@med-net.ucla.edu or visit geronet.ucla.edu/companioncare.